A leader in today's concrete admixture business, TAKEMOTO Oil & Fat Co., Ltd. began the commercial development of the chemical admixture in 1954. These chemical admixtures have become essential for improvement in quality and durability of concrete. The company's focus on research and development led it to pioneer the development of Polycarboxylate-based superplasticizer (PCE) in 1987. The development of PCE enabled to make ultra-high strength concrete over 100MPa of strength and self-compacting concrete (SCC), and contributed to the progress in concrete engineering. TAKEMOTO has concrete admixture business in Japan, China, Korea, Taiwan, Vietnam, India, US and EU. TAKEMOTO continues to expand its technology to provide the highest performing products in the global admixture markets. Research is ongoing at TAKEMOTO to bring the newest admixture technology to the industry. 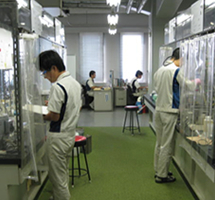 Polycarboxylate type superplasticizers (PCEs) were firstly developed over 20 years ago in Japan. PCEs can greatly reduce water demand and cement contents by both effects of electrostatic repulsion and entropic stabilization. 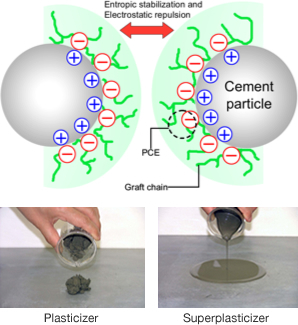 And PCEs also maintain the fluidity of concrete much longer than normally observed with Naphthalene based polymers and Melamine based polymers without excessive retardation. Recently new generational PCE has been developed. This new PCE shows high fluidity and viscosity-reducing property and shrinkage-reducing capability, especially for high strength and ultra-high strength concrete with 60 to 150 MPa of compressive strength. PCE are also especially useful for producing self-compacting concrete (SCC) along with improving concrete durability.